Offshore wind energy may soon change thanks to a new kind of turbines that literally floats on water. The first 2.3 MW prototype was installed 10 kilometers off the Norwegian coasts on June 8th. Developed jointly by Siemens and StatoilHydro the Hywind windmill can be located where seas depths reach from 120 to 700 meters, compared to 30-50 meters nowadays. This technology enables the turbines to harness more wind than a traditional model. Another advantage of that is the liberty of installation as the limits depths are more important. 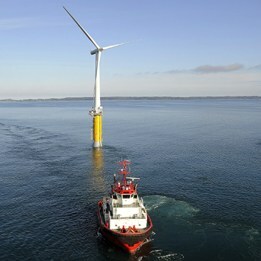 StatoilHydro and Siemens installed the world’s first large-scale floating wind turbine. The turbine is located approximately 12 km south east of Karmøy in Norway at a water depth of about 220 meters. The Hywind project was developed by StatoilHydro, and Siemens supplied the SWT-2.3 MW wind turbine with a rotor diameter of 82 meters. Over the next two years the floating wind turbine will be tested to provide a thorough analysis of this innovative concept. The Hywind turbine will be connected to the local grid and is expected to start producing power in mid-July. Hywind is designed to be suitable for installation in water depths between 120-700 m, which could open up for many new possibilities within offshore wind turbine technology. Existing offshore turbines are mounted firmly on the seabed. However, foundations become very expensive at water depths of more than 30-50 m. This might limit the large scale exploitation of offshore wind power particularly in countries with little or now shallow water areas near the coast line. “Hywind could open for new opportunities for exploitation of offshore wind power, as the turbines could be placed much more freely than before”, says Henrik Stiesdal, CTO of the Siemens Wind Power Business Unit. The wind turbine supplied by Siemens is a SWT-2.3-82 with a 65 meter hub height. StatoilHydro is responsible for the floating structure, which consists of a steel floater filled with ballast. This floating element extends 100 m beneath the surface and is fastened to the seabed by three anchor wires. StatoilHydro and Siemens have jointly developed a special control system for the Hywind turbine to address the special operating conditions of a floating structure. In particular, the advanced control system takes advantage of the turbine’s ability to dampen out part of the wave-induced motions of the floating system. “Just as when we built the world’s first offshore wind farm 18 years ago this project has its particular challenges”, said Stiesdal. “We have created an advanced system that we trust will be capable of managing the special operating conditions of the floating turbine. For more on this most interesting technology, please check out the StatoilHydro page with videos. Wind energy is often criticized for being noisy, disrupting wind pattern, even being a hazard to birds and bats as well as creating varioushealth issues to humans. I hope that by installing them far off shore, most of those issues will be resolved and that by making them float, no one will say that they damage the sea floor. Thanks Giles for your comment and opinion. I hope too that installing floating wind turbines will solve the relatively few issues faced by wind energy. They do have some arguments that are worthy of further studies. however, I find that those who complain about windmills out in the ocean as ruining the view rather capricious. It is like complaining that a sailboat ruins the view! Windmills are not necessarily an eyesore, especially when they can be located a dozen kilometers off shore where they are, for all intent and purpose, invisible from shore. So yes, the Hywind is to me a very good idea. At what point a wind turbine becomes unnoticeable ? I guess that 10 km / 6 miles would be enough. Then, there is the question of power loss and cables… This reminds me there are no really perfect solution when it comes to our energy issues.